One of the best things about the Maison Européenne de la Photographie, located in the Marais district of Paris and recognized as one of Europe’s premier photography galleries, is its consistently open-minded approach to the medium. Jérémie Nassif’s gem of a solo show, ‘Envols’, accompanying the publication of his latest book of the same name, embodies this perfectly. Nassif combines the photograph with classic drawing materials – charcoal, pencil, etc. 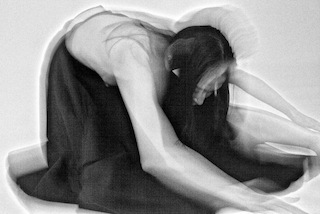 – to capture the performances of several dancers the artist followed and worked with for several years. The end product is a remarkable rendering of the action and fluidity of dance. Framed within a pure white background, Nassif’s performers seem to split apart in front of our eyes as they move, the result of long exposures and some inventive use of shading on the artist’s part. As François-Marie Banier states in his introduction to the exhibition, Nassif displays a ‘consummate mastery of line’ – though his images capture the flowing movement of his subjects particularly well, they never seem messy or crowded. The actress Charlotte Rampling’s ‘Secret Albums’ is similarly noteworthy, though its premise may appear self-indulgent if misunderstood. The exhibition is made up of three parts – photographs of Rampling taken by various well-known photographers, photographs taken by Rampling documenting her own life, and a selection of self-portraits of various photography greats selected by Rampling from the Maison Européenne de la Photographie’s own collection. It would be easy to dismiss the show as egotistical self-exploration on the part of Rampling – however to do so would be to completely miss the point. The portraits of Rampling are less about their subject than the artists who took them (Juergen Teller, Helmut Newton, Peter Lindbergh, among others), as well as the various photographic fashions of the last 50 years. Even Rampling’s own photographs aren’t really about her – though of course amateur in many ways, they do have a documentary value, particularly the images taken by Rampling of her travels in East Asia. The most interesting aspect of the exhibition, however, is the series of self-portraits of noted photographers. Subjects range from Duane Michals and Larry Clark to Nan Goldin and WeeGee. Like Rampling’s own portraits, this series acts as a kind of miniature ‘history’ of modern photography in its own right. The fact that this section of the show is its standout feature suggests even a basic knowledge of Rampling’s life isn’t necessary to understand it – in the end the actress takes a backseat to an interesting exploration of mid-to-late 20thcentury photography. Là-bas (‘Over There’) is a collection of video installations by nine Israeli artists that explore complex personal, political and often controversial issues. To quote the exhibition’s introduction, the concept of Là–bas is to address the ‘Otherness’ with which Israel is often associated by the rest of the world. The result is a fascinating exploration of life within a politically and socially diverse nation from the point of view of those who experience it from day to day. Entering the exhibition, we are presented with Nina Pereg’s ’67 Bows’. Here, Pereg has recorded the reactions of sixty-seven flamingoes in a glass cage to the sound of a gun being cocked and fired. We watch as the flamingoes become so accustomed to bracing at the sound that eventually the gun does not need to be fired at all – the sound of it being cocked is enough to force a reaction from the birds. Pereg’s explains this installation as a statement addressing the absurdity of the use of weapons as a consequence of fear. Yael Bartana’s ‘Trembling Time’ similarly deals with issues of weapons and warfare – her installation records the annual two-minute silence observed by Israelis in remembrance of soldiers killed in fighting, here carried out by motorists on a freeway. As the motorists leave their vehicles to observe the silence, Bartana manipulates light, sound and speed to great effect – the result is both dramatic and emotionally moving. Sigalit Landau’s ‘Azkelon’ directly addresses the Arab-Israeli conflict and reveals the artist’s deep personal desire for a dialogue to develop between the two peoples, while Tom Pnini’s ‘Volcano Demo’ – a recording of a paper mâché volcano built by the artist on his own roof being set alight – explores what Pnini sees as both the conscious and unconscious anxiety regarding the past, present and future felt in Israel at all times.